Dylan Hannon, Curator of Conservatory Collections at the Huntington Botanical Gardens, highlights the merits of some of the less common bulbs from around the world that are especially suited to our Mediterranean climate. Whether you live along the coast or further inland, there are a great variety of fascinating and exotic bulbs that will thrive in the sunny and shady areas of your garden or home. Dylan’s talk will include fabulous photography as well as live bulbs and plants. Dylan is noted for inspiring the home gardener to search out less well known varieties that are easy to cultivate but may not be profitable for nurseries to grow in bulk. His tips on soil mixes, light, watering, dormancy, propagation and sources will have you searching out and adding many new and exciting bulbs to your own garden. He will focus on some of the less common geophytic plants from around the world that are suitable for Mediterranean climates and indoor cultivation. 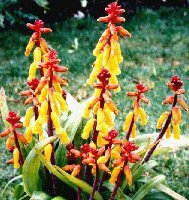 Examples will include amaryllids (species Narcissus, Eucrosia, Brunsvigia, Haemanthus, Strumaria), hyacinths such as unusual Lachenalis, Massonia, Drimia and Albuca, and unique groups like Eriospermum and Oxalis. Dylan Hannon has worked as Curator of Conservatory Collections at The Huntington Botanical Gardens since 2003. 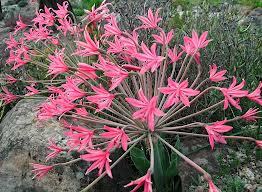 He also collects, photographs, propagates and sells rare bulbs, primarily from South Africa, South America and Mexico. Prior to joining the Huntington, from 1995 to 2004 he worked as Plant Propagator at Rancho Santa Ana Botanic Garden, and previous to that post worked at a wholesale cactus nursery and performed botanical surveys in southern California. In the mid-1980s Dylan worked as Research Assistant to Dr. Thomas B. Croat at Missouri Botanical Garden, concentrating on the aroid family (Anthurium, Philodendron, etc.). Dylan grew up in Santa Barbara, CA where the range of Mediterranean plants is among the most diverse in the world.